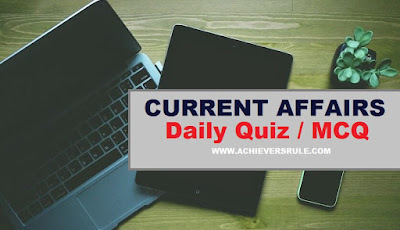 You must solve the Daily Current Affairs Quiz - 8th January 2018 question set to check your awareness level essential for the upcoming Railway, SSC, IBPS exams. Read the Current Affairs Update - 8th January 2018 to know the important recent happenings in brief. Q1. Which state has recently formed the Minorities Commission ? Q2.Which Bank has partnered Induslnd Bank to introduce a facility to create a fixed deposit when the customer balance exceeds Rs 1 lakh at the end of day ? Q3._____ has recorded the highest Gross Enrolment Ratio or GER for females in all categories of higher education according to the 2016-17 report of All India Survey on Higher Education (AISHE) . Q4.Gilles Simon beats Kevin Anderson to win inaugural Tata Open Maharashtra. They are associated to which sports ? Q5.Prime Minister Narendra Modi would address top police officers of the country at a three-day annual conference organised by the Intelligence Bureau (IB) in _____ . Q6. Name the country that is building the naval base in Gwadar, Pakistan . Q7.Which Ministry (ies) has/have signed Memorandum Understanding (MoU) for joint funding of Technology Mission for Indian Railways (TMIR) ? Q8.The Income Tax Department relaxed norms for levy of _____ on companies facing corporate insolvency proceedings . Q9.Which Indian state first has launched the High Risk Pregnancy Portal ? Q10.Indian Navy has signed a pact with which of the following Port Trusts ? Q11.NASA has released the Logo for its ___ Anniversary . Explanation 1. Telengana has recently formed the minorities commission. Mohammed Qamaruddin is the Chairman and Rajarapu Pratap is the vice chairman of the Commission. Explanation 2. Paytm Payments Bank has partnered Induslnd Bank to introduce a facility to create a fixed deposit when the customer balance exceeds Rs 1 lakh at the end of day. Paytm Payments Bank customers can redeem their deposits instantly, anytime without paying any pre-closure or miscellaneous charges and can earn up to 6.85% annual interest. Explanation 3. Chandigarh has recorded the highest Gross Enrolment Ratio or GER for females in all categories of higher education at 68.8 per cent, according to the 2016-17 report of All India Survey on Higher Education (AISHE) launched by Union Human Resource Development (HRD) Minister Prakash Javadekar. Explanation 4. Tennis Player Gilles Simon beats Kevin Anderson to win inaugural Tata Open Maharashtra. The unseeded French player, ranked 89, tamed big-serving Anderson, ranked 14 in the world, 7-6(4), 6-2 in the summit clash, watched by a packed house at Balewadi Sports Complex. Explanation 5. Prime Minister Narendra Modi will address top police officers of the country at a three- day annual conference organised by the Intelligence Bureau (IB) at Tekanpur in Madhya Pradesh. Explanation 6. After Djibouti, China to Build Second Foreign Naval Base in Pakistan. China is planning to build its second overseas naval base near Pakistani’s Gwadar port following the opening of its facility in Djibouti last year. Explanation 7. Ministry of Railways, Ministry of Human Resource Development (HRD) and Ministry of Science & Technology have signed Memorandum of Understanding (MoU) for joint funding of Technology Mission for Indian Railways (TMIR). The MoU aims to facilitate co-financing of (TMIR) by investment sharing for identified railway projects for applied research. Explanation 8. The Income Tax Department relaxed norms for levy of Minimum Alternate Tax (MAT) on companies facing corporate insolvency proceedings. As per Section 115-B of the Income Tax Act, MAT is levied on book profit after deducting the amount of loss brought forward or unabsorbed depreciation, whichever is less. Explanation 9. Haryana has achieved the distinction of becoming the first state in the country to launch High Risk Pregnancy (HRP) Portal. This portal not only helps in early identification of high-risk pregnant cases up to the grass-roots level but also ensures their timely referral to the civil hospitals for further management and delivery by specialists. Explanation 10. The Indian Navy inked a MoU with the Cochin Port Trust (CPT), Kerala towards leasing of 228 meters of berths at Mattancherry Wharf for a period of five years.The MoU has been concluded to cater for the futuristic requirements of the Navy with the sizeable increase in its fleet scheduled in the near future. Explanation 11. NASA has released Logo for the 60th Anniversary. The logo depicts how NASA is building on its historic past to soar toward a challenging and inspiring future.